Plants need water–but what about when it's running low? Is it possible to use less water and still have healthy crops? In Texas, the Southern High Plains uses water from an aquifer to water cotton fields. However, the aquifer is running low, so it's important to use less and less water. Scientists from the area are working to find the best irrigation method for cotton that uses the least water. They want to do this without loss of cotton yield and profits to struggling growers. "Cotton is the most popular natural fiber in the world, and the United States is one of the top three producers of cotton in the world," says Glen Ritchie of Texas Tech University and Texas A&M AgriLife. Ritchie helped lead the study. "With the decline of water supplies in this area, there is an interest in how to limit the amount of water the cotton requires but keep it healthy. Determining the effects of less water will allow producers to get the most out of the water they use." Cotton fruits are called bolls and are the easily recognized white fluffy clumps. The bolls are produced at different times on different parts of the plant. Bolls near the bottom of the plant and close to the main stem are from early in the growing season. Bolls higher on the plant or further from the center of the plant are produced later in the season. The experiment looked at how different irrigation patterns affect boll number (yield) and quality. 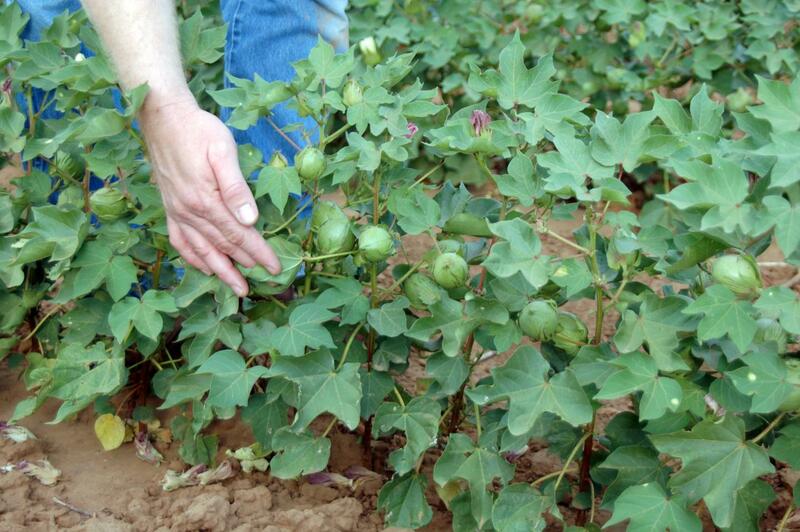 "Determining the location and number of bolls on a cotton plant gives a great analysis of the plant's life," Ritchie says. "It can give us information into which periods of the season it was stressed and its response to that stress. It also tells us how it stayed healthy and made fruit within the environment it grew in." Researchers used three watering rates at three different times to see which combination stressed the plant the least. For example, some cotton received a low level of water early in the growing period, medium irrigation in the middle of the growing period, and a high level at the last bit of the growing period. Researchers studied 27 combinations total–every possible combination of the three levels at three different time periods. The results show that less water early in the growing season makes plants smaller but has little effect on cotton yield, and doesn't affect fiber quality. In the middle of the season, however, irrigation rate had a big impact on yield, although only the lowest irrigation rates hurt fiber quality. Finally, late in the season irrigation rate also affected yield, but the most obvious impact was a big decrease in fiber quality with declining irrigation. "Our findings challenge the common assumption that, in water-limited situations, producers should irrigate early and often to build up a 'water bank' in the soil," Ritchie says. "Instead, lessening irrigation after plants come out of the soil will get plants used to less water and still result in good yields and fiber quality. Conversely, if water is limiting, over-irrigating early will increase the risk of poor fiber quality." Ritchie says the next steps in their work include stopping irrigation at more precise time points to identify the effects on both yield and fiber quality. For example, would it be okay for a grower to cut off watering during the first week of flowering but bad to do so during the third week of flowering? Through this work, researchers hope to extend the life of the aquifer, a dwindling underground water source. "We have to know which portion of the growing season is going to be the most affected by water use," Ritchie says. "We need to use each drop to its full potential." Read more about this research in Agronomy Journal. Other researchers include Curtis Schaefer and James Bordovsky. This research was funded by grants from the Ogallala Aquifer Program and Cotton, Inc.